Organics is nothing new. In fact, until the early 20th century all gardening was organic. It was not until the the introduction of chemicals into gardening that the rules changed. With the introduction of those chemicals, gardeners switched to them as a better and more effective way of growing, not realizing that they really were neither. What it did do was cause serious health risks and environmental safety. The benefits of organic produce are clear to many more people today. The success of local farmers markets and the availability of organic produce demonstrate the growing popularity of this healthy way to grow what we eat. Here are some of the reasons to switch to organic gardening for you and your family. ~ Health: In recent years, it has become very clear that ingesting chemical fertilizers, insecticides, and herbicides is just plain bad for our health. These chemicals, even in trace amounts, especially harm children. Organic fruits and vegetable eliminate these chemicals from our diets. ~ Nutrition: Organic fruits and vegetables are significantly higher in the essential vitamins and nutrients we all need to maintain robust good health. ~ Taste: There is no denying that picking fruits, herbs, and vegetables at the peak of ripeness and serving them right away assures us of maximum flavor for our tables. Fresh herbs from the garden also enhance the food we eat, far more than wilted or dried herbs from elsewhere. 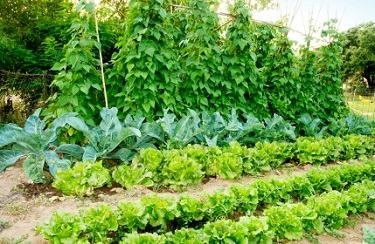 ~ Freshness: Food grown organically on our own property is always at the peak of freshness. Fruits and vegetables begin losing their nutritive value from the moment they are picked. Assure maximum nutrition and taste by growing your own. ~ Variety: By growing a wide variety of organic fruits, vegetables, and herbs in our gardens, we can take advantage of a more balanced, varied diet. Including heirloom varieties of our favorite fruits and veggies in our gardens also adds variety to our diet. ~ Savings: If you buy organic produce for yourself and your family, you know that you pay more for it at your local supermarket or farmers markets. Growing your own food is a natural way to stretch your budget, and growing it in an organic garden means saving on costly chemical additives. ~ Family Hobby and Sharing: Involving the entire family in organic gardening projects helps to promote togetherness, and also provides many hours of enjoyable and healthful activity. As an additional benefit, children tend to eat more healthful fruits and vegetables if they have a hand in growing them.